It’s beginning to look a lot like Christmas! Around us we see decorations, holiday sales, and traditional holiday food and drink like egg nog and candy canes. Turn on the radio and you can hear Donny Hathaway croon “This Christmas” as well as Michael Jackson and his brothers let us know that “Santa Claus is Coming to Town.” It’s a magical, highly anticipated time of the year. There are hundreds of cartoons and movies to commemorate the occasion from the iconic A Charlie Brown Christmas to the modern classic A Christmas Story and everything in between. In recent years, I’ve become partial to The Proud Family’s Christmas/Kwanzaa episode and it is heartwarming in my adult years to see Fat Albert’s Christmas episode. Last week I began thinking about traditional Christmas stories like the infamous T’was the Night Before Christmas that many of us have heard as a kid or read to a child as an adult. But then I thought, what holidays stories are told for us, by us? The Literary FUBU if you will. Librarian and book collector Arthur Schomburg once said, “We need a collection or list of books written by our men and women.” So true, so very true. Does the name Schomburg sound familiar? It should. As in the Arthur Schomburg Center for Research in Black Culture part of the New York Public Library in Harlem. I present to you some of the books that I was able to find that revolve around the winter holidays of Christmas and Kwanzaa that either have been written or illustrated by a Black person. Their names have been bolded below. It is my hope that if you know of other holiday books that fit the criteria, you will share them with The Brown Bookshelf family so we can all add to our bookshelves and add to that list that Arthur Schomburg dreamed of many years ago. Thanks for sharing this! I’m the author of a just published (in October) book titled: “Kwanzaa: From Holiday to Every Day.” It contains a resource listing of Kwanzaa books and music CDs for both children and adults. A few titles of interest for kids are: “Between Father and Son” (formerly “A Kwanzaa Fable”) by Eric Copage, “Kwanzaa Celebration: Pop-Up Book” by Nancy Williams and “It’s Kwanzaa Time!” by Linda and Clay Goss. My book also lists hundreds of book, music and film gift suggestions, has a directory of stores and online sources for gifts and Kwanzaa-table items, a listing of public Kwanzaa celebrations to attend around the nation and an interview with the woman who hosted the very first Kwanzaa in their living room in 1966! Please ask you local bookstore to order it or visit amazon.com . And let’s model for the youth how to live these principles all year! 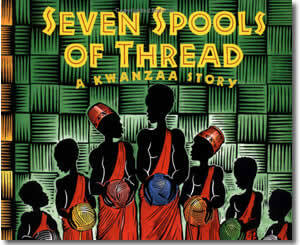 I actually just realized last week when our holiday book requests started coming in that my library has a severe lack of Kwanzaa books. Hopefully that shall be remedied soon. Thanks for the list!! Thanks Kelly and Don for the additions to the list! Another site suggested a book of poetry titled Under the Christmas Tree by Nikki Grimes.